Mosquitoes, crows and robins spread this shifty threat to public health. Leigh Cooper explores the viral frontier. Illustrated by Dakota Harr and Jennifer Bates. Under the microscope, he points out a white stripe running down each of the mosquito’s dark legs to its small claws. With a twist of the tweezers he draws attention to the mosquito’s proboscis. The piercing mouthpiece looks like a chocolate-dipped cannoli, brown at each end and light tan in the middle. Kovach will separate the Culex mosquitoes from the many bugs he collected while tromping through bogs and farm fields north of Sacramento. 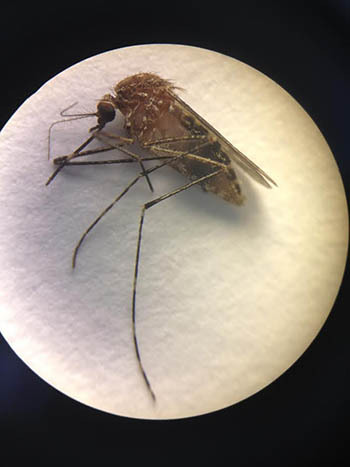 A Culex tarsalis mosquito, collected by UC Santa Cruz researcher Tony Kovach. He has his work cut out for him—2 million mosquitoes’ worth of work. Kovach will grind up the bodies and extract genetic material from the mosquito slurry. He’s looking for a specific genetic sequence carried within some of the insects. He’s searching for West Nile virus. “West Nile is scary because it’s a mosquito-borne disease that also affects people in developed countries,” Kovach says. After spreading across the United States in just six years, West Nile virus has scientists racing to catch up. The virus winged its way across the landscape in the bodies of its hosts, specific mosquitoes and birds. Some bird species, such as robins, act as feathery virus bombs, easily infecting hundreds of mosquitoes. The virus’s arrival in the U.S. killed millions of birds, decimating some populations. But sometimes, the mosquitoes also feed on mammals like us. The number of human infections in the U.S. has fluctuated year to year by 50-fold, making it hard for public health officials to prepare for future outbreaks. And although the disease has killed no more than 300 people in any year, it could get worse. With humans as collateral damage, scientists must unravel the ecology behind the spread of West Nile virus. Only when they understand all parts of the disease’s cycle—birds, mosquitoes, virus, and the surrounding environment—can they begin to predict and limit West Nile outbreaks. First identified in Uganda in 1937, West Nile virus entered New York City in 1999. It spread throughout the contiguous U.S. by 2004; bad outbreaks struck in 2002 and 2003. After eight years of relatively fewer human infections, the CDC recorded 2,873 cases and 286 deaths in 2012—the deadliest year yet. 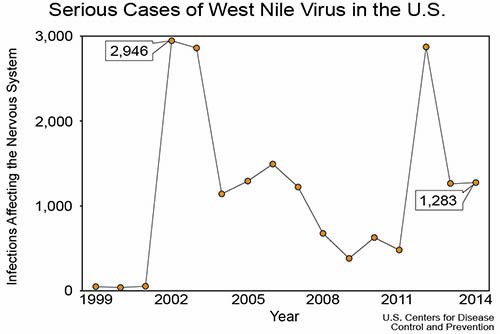 West Nile virus first appeared in the U.S. in 1999. Most people who contract the virus never know they’ve been infected. A quarter of those infected experience fever and headache, but about one in every 400 infections invades the patient's nervous system. About 10% of those patients die. Adding to the public-health unpredictability, outbreaks flare up in hotspots. In 2012, four Texas counties hosted 48 percent of the state’s cases. In the same year, 56 percent of the most seriously ill patients lived in just five states: Texas, California, Illinois, Louisiana and Michigan. National numbers were lower in 2014, but 536 Californians suffered from the disease’s harshest symptoms and 29 patients died—possibly the worst year yet in the state, startling public health officials. Only about 25 percent of people infected with West Nile virus become sick. Most develop a fever, headache and vomiting, which passes within a few weeks. But one percent of those sickened by the virus suffer a much harsher infection called West Nile neuroinvasive disease. This disease inflames tissues in and around the brain, sometimes causing paralysis similar to polio. Ten percent of these patients die. Many survivors have permanently weakened limbs. In 2014, the U.S. Centers for Disease Control and Prevention tracked 1,283 West Nile Virus infections that developed into "neuroinvasive" cases, affecting the patient's brain or spinal cord. 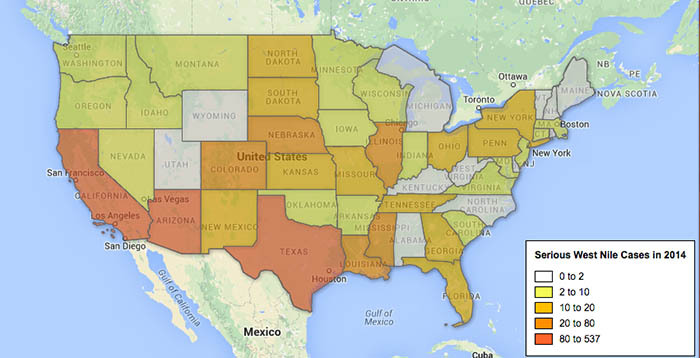 Click on the map for an interactive version to see state-by-state infection numbers. Epidemiologists know the basics of how the virus spreads. Female mosquitoes sip blood to produce eggs; they need the extra protein. But the bugs pick and choose their blood meals fussily. “Some specialize on birds, some on reptiles, or bunny rabbits or deer,” says Jordan Ruybal, a disease ecology graduate student at UC Santa Cruz. Many Culex mosquitoes prefer to dine on birds. If the bug carries West Nile, the bird can become sick and pass the virus on to other hungry mosquitoes. But Culex aren’t so finicky; they will bite other animals walking by. “If they come across [another meal], they’ll try it out,” says Ruybal. Culex mosquitoes will nip people, but West Nile has not evolved to reproduce well in human blood vessels. A virus cannot reproduce on its own; it hijacks a host’s cells to make new virus copies, a process called replication. The cells of Culex mosquitoes and many birds are West Nile factories. The cells of most mammals, including humans, are not. As “dead-end hosts,” we don’t produce enough virus to infect the next mosquito that bites us. “The mosquitoes get a good dinner [if they bite us], but they don’t pick up virus,” says Reisen. That’s the big picture, but the factors driving where outbreaks occur—and why some are so severe—have eluded scientists. Only continued research and mosquito surveillance programs will help scientists control West Nile outbreaks, says Reisen. Lessons learned from studying West Nile also may help scientists understand similar mosquito-transmitted viruses. Some, like Saint Louis encephalitis virus, are already in the U.S. Others, like Japanese encephalitis virus, are not. But with global travel and a warming climate, foreign mosquitoes and their viruses may arrive and find a hospitable new land. 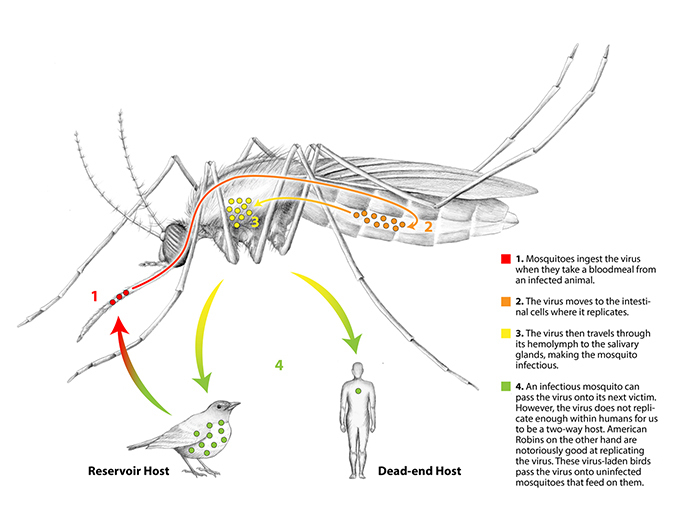 The West Nile virus infection cycle. Click on graphic for a larger version. Scientists must explore a mosquito’s hunting grounds to trace the spread of West Nile. Many West Nile-carrying mosquitoes have discovered that human-modified landscapes are homey neighborhoods. For example, Culex pipiens, the northern house mosquito, flourishes in urban settings. It reproduces in rain gutters, flower pots and drainage ditches. Culex tarsalis can prosper in backyard swimming pools and farm fields. 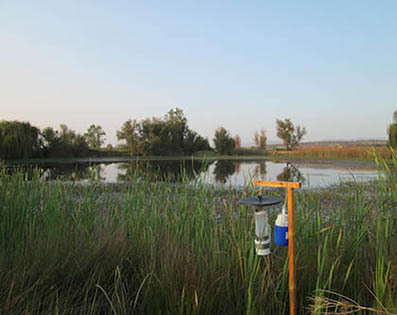 West Nile virus can spread in cityscapes and countrysides, but Kovach focused his research on 80 different wetlands in California’s fertile Central Valley. Culex mosquitoes lay their bullet-shaped eggs, which coalesce into floating rafts, in the wetlands. Kovach wants to know which wetland traits create the perfect nurseries. Some of his boggy study sites are natural, some are manmade, some have fish, others don’t. They all vary in temperature, size, and water levels. To capture mosquitoes, Kovach uses fan traps baited with dry ice. The set-up looks like a hangman’s scaffold. The dangling fan blows downward into a long, lightweight sock. A little cooler filled with dry ice—frozen carbon dioxide— hangs next to the fan. The mosquitoes home in on the carbon dioxide, which usually comes from an exhaling animal. The fan then blows them into the sock, creating a trapped mosquito jumble. A blue cooler of dry ice emits carbon dioxide, which lures mosquitoes toward a mosquito fan-trap in the Spenceville wildlife area, Yuba County, California. 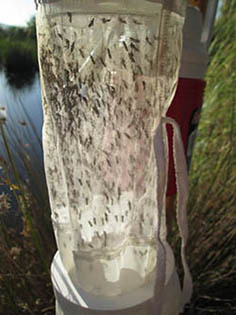 One night’s worth of mosquitoes caught in a mosquito fan-trap. Kovach has collected almost 2 million mosquitoes from 18 different species. Many species are rare or do not carry West Nile, so he tests only eight for the virus. For each location and each night of collection, he grinds up each species separately and extracts genetic material—specifically, RNA—from the goo. Kovach isolates West Nile RNA from the bugs’ RNA with a genetic screen. In this way, he can track changes in the number of infectious mosquitoes and identify which wetlands produce the most West Nile. 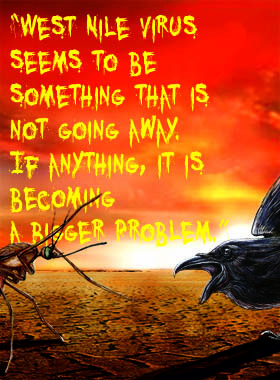 As Kovach picks through his bugs, he comes across mosquitoes filled with blood. He can extract certain genes from the captured blood that identify which species the mosquito bit. “And it’s really specific, too,” says Kovach. For instance, he can tell that a mosquito dined not just on a bird, but on a robin. As part of the project, Kovach estimated how many birds, cows and horses lived close to his wetland sites. He wants to know whether mosquitoes stop and feed on the mammals or whether they skip the herds and go straight for the birds. If the mosquitoes encounter only dead-end hosts—animals that don’t produce tons of virus in their blood—while searching for a meal, they cannot become infected. Once completed, Kovach’s study may reveal whether the presence of dead-end hosts like cows and other grazing animals reduces the local risk of West Nile infections in people. Mosquitoes don’t travel far, but birds can wing West Nile across vast distances, all the while building up virus in their bodies. But what’s good for the goose may not be good for the gander; birds vary in their ability to survive West Nile virus. “Crows just croak,” says Jordan Ruybal of UCSC. Once infected, all crows die. Other hard-hit species include titmice, chickadees, wrens and thrushes. But some species, like chickens, don’t replicate the virus effectively. “It’s hard to tell if a chicken gets a headache, but if you watch them in a cage you can’t tell the infected from the non-infected chickens,” says Reisen. Birds like crows and ravens are pros at replicating West Nile. Their blood can carry more than a billion times the viral concentrations of a person’s blood. Any mosquito that bites them will get a huge dose. The bird species spreading the most West Nile vary with geography. In eastern states, Culex mosquitoes really like robins: they take up to 80 percent of their blood meals from the birds. Robins may smell especially good to the mosquitoes, or the birds may not be able to shake off the bugs. Researchers don’t yet know. In cities, only birds that are compatible with humans survive. In Los Angeles, about 75 percent of mosquitoes feed on house finches or house sparrows. “That’s a simple mosquito-bird cycle,” says Reisen. Outside Sacramento, Reisen found, every other mosquito fed on a different animal, including dead-end hosts—a much less efficient transmission cycle for the virus. Podcast produced by Leigh Cooper. Click on image to play. Mosquitoes, birds and virus are the ingredients of an outbreak. But the size of each outbreak also depends on the baking conditions, scientists are learning. 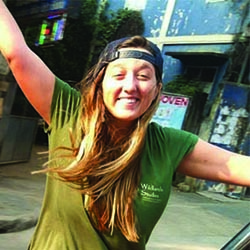 Sara Paull, a postdoctoral disease ecologist at UC Santa Cruz, is trying to understand why the number of West Nile neuroinvasive cases varies from year to year—even when the ingredients are in place. Her team’s analysis points to two key factors: human immunity and drought. If we’re exposed to West Nile, we make antibodies that protect us from future infection. The level of human immunity varies among states, because not all regions have experienced large human outbreaks. Immunity among U.S. populations ranges between 0 to 14 percent. Those values may seem inconsequential, but Paull argues that only a subset of us—outdoorsy people, homeless people, and those who send tantalizing chemical cues to Culex mosquitoes—are highly prone to being bitten by West Nile carriers. “In states where human immunity is stronger, you don’t expect to see as many cases in the future,” says Paull. Once the prone population has contracted the virus, they can’t be re-infected—and the number of West Nile cases should drop. Dry spells also influence the spread of West Nile, Paull says. Indeed, drought has helped explain the number of human neuroinvasive infections in almost half of the states; the worse the drought, the more cases of West Nile. In an especially hot and dry year, Paull predicts a doubling of cases. That seems counterintuitive, but scientists have an explanation. During a drought, the small pools that persist tend to be polluted with rotting organic matter. Several West Nile virus–carrying mosquitoes “breed very, very well in dirty water,” says the CDC’s Nicholas Komar. “When the water is clean, [virus carriers] compete with other mosquito species.” On top of that, Paull says, the mosquitoes and their hosts clump near water sources when it’s dry. If everyone starts eating off the same dinner plate, it’s easier for mosquitoes to become infected. The mosquitoes’ relationship with rain can be tumultuous. More rain means more egg-laying locations, but large storms can wash away water-bound eggs, larvae, and pupae. Drought and heat often come packaged together, and heat can increase virus transmission—to a point. The virus replicates faster in mosquitoes when it’s warm, so they become infectious more quickly. But if it gets too hot, the insects will die. When the mosquitoes, birds, human immunity and climate all fit together just so, the conditions may trigger a West Nile outbreak in people. Local public health officials would like to know the chances for an outbreak during any given year. With forewarning, they could reduce mosquito populations and cut down the number of human cases. When local and state budgets permit, officials survey mosquito populations for West Nile. If the number of mosquitoes testing positive passes a certain threshold, officials escalate their pesticide use. “They routinely do adulticiding [spraying areas where adult mosquitoes congregate] to break the chain of transmission before you have a huge number of human cases due to the spillover from the bird and mosquito cycle,” says Reisen. However, most states can no longer afford to do such surveys, even though hospitals still encounter West Nile cases. These states are like hotels without smoke detectors; the next flare-up could kill hundreds of people. 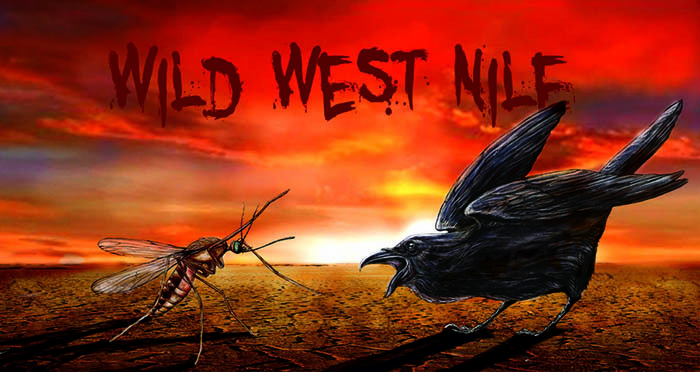 The disease’s erratic nature and other pressing public-health priorities have left the public vulnerable the next time West Nile sidles into town. My professor advised me to become a science teacher after my partner and I, dressed as kangaroos, presented our kangaroo mating study as an episode of the radio call-in show "Loveline." Until then, I never thought to share my dizzying enthusiasm for the natural world through teaching. I had forgotten what I had once known instinctively: As a teacher, I needed to find that one story, study, or kangaroo costume that viscerally engaged my audience. Now, as a science writer, I will connect my readers with a world where each brook and beetle bursts with a captivating tale to tell. Dakota Harr is an illustrator based in Washington state. 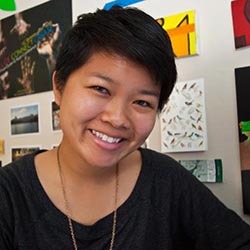 From a young age she has had an interest in art and frequently found inspiration in the natural world she explored, something that ultimately led her to science illustration. With science illustration, Dakota hopes to help educate people about wildlife, particularly species in need of conservation. 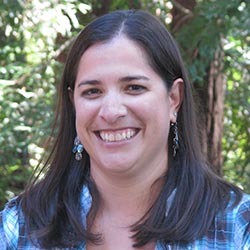 Jennifer Bates is a scientific illustrator and nature enthusiast born and raised in California. She spent her early years getting covered in graphite, paint, and clay. It wasn't until college that she became enamored with the natural world as well. Hands stained by art supplies quickly became hands crusted in dirt and hardened by exploration. Combining her interests in fine art and zoological field work, Jennifer has found her niche in the realm of scientific illustration.